I have to admit I'm a bit fussy when it comes to my makeup. I hate powdery foundations that stick to dry patches that I didn't even know existed. I always go for something that will make me look as if my skin is naturally dewy and flawless. It was a long search, trying many foundations, until I finally found 'the one'. 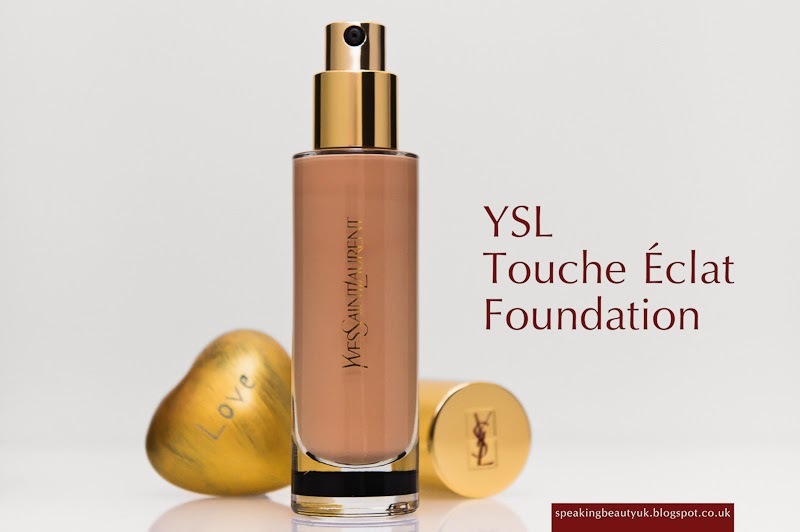 YSL Le Teint Touche Éclat Foundation is amazing! The packaging is super elegant, with a glass bottle and a golden lid. The texture is very light on the skin and I'd describe the coverage as light to medium. I apply only one pump and I think it looks gorgeous and very natural. It's got a lovely dewy finish and a brightening effect. I'd say it's more suitable for dry to combination skin, even though girls with oily skin could still wear it, but I'd definitely recommend setting it with powder. Another big bonus is that it's got a massive shade range, so I'm pretty sure anyone can find one that will suit them. I wear YSL shade BR30 and it's absolutely perfect for my skin tone. It's also got SPF19, which is great. In the winter I tend to rely only on my makeup to get sun protection. And the good news is, even though it has SPF, I haven't noticed any flash back with this foundation. The bottle size is 30ml, as most high end foundations, and it cost £30.50 (available here). I don't think the price is that bad, especially when compared to Chanel Vitalumiere (£36) and Giorgio Armani Luminous Silk (£35.50). And in my opinion, is totally worth the money. Such a luxurious product and a definite must have for me. I bought this a few months ago and I agree, it is superb. But would you believe, I've just read of their latest offering, which is the new YSL Fusion Ink Foundation. It's a never-ending chase! You buy the best thing since sliced bread, and something bigger and better comes along. That's why I've about a dozen bottles of foundation in my make-up arsenal! This sounds great! I will definitely be picking up a sample tomorrow when I go to John Lewis :) thanks for the fab review!